After a week of horrors I was actually able to get the babies to day care and go to work on Thursday. It was a good feeling even though I was nervous every time my phone vibrated that day care was calling me again to tell me that Elliott had stubbed his toe and would need a complete physical before he could return to day care. Martin, being the rambunctious lunatic that he is, did actually bang up his nose at day care but they didn't call me. They simply explained that he was a wild man, banged his nose on the side of a counter, and then made me sign some paperwork promising to not sue them for the damage to my child. In a weird first Martin was unable to stay awake after getting home. If it wasn't for Elliott's wild nature I would have thought there was a carbon monoxide leak in our apartment. I continually shook him, patted his back, and tapped his cheeks, but nothing would keep him awake. I had huge reservations about putting doing it but I put him to bed with no dinner and no bath. I spent the rest of the night thinking he'd wake up any minute but in a surprise shock I went to bed at 10:00 PM and woke up at 6:00 AM. A full eight hours of uninterrupted sleep! 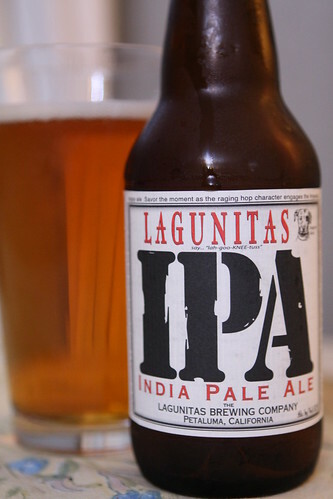 Since yesterday was IPA day I purchased a bottle of Lagunitas IPA, a classic IPA which I shockingly have never had. It was pretty great. I wanted to go with some fancy, extravagant double IPA or something to celebrate the day but when I saw this at the store I figured it would be better to stay with a classic. 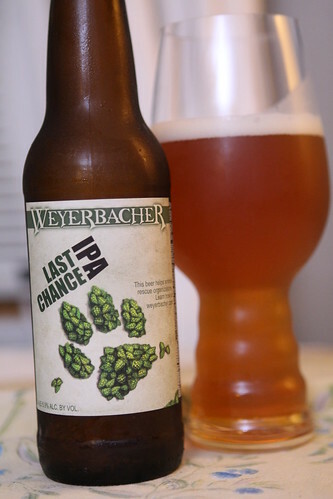 After that I had this Last Chance IPA by Weyerbacher. This was not as good as the Lagunitas but it was a beer released to support animal rescue organizations so at least I could retire for the evening with a feeling of righteous self-importance. I was so exhausted from the long week that I almost immediately passed out after dinner. Tonight Jen arrives back home and my workload reduced by half. It's hard to not be excited about some help with our freshly recovered children. Oh, and it will be good to see my wife too.